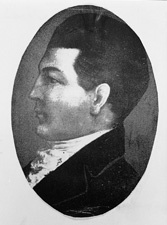 BIBB, William Wyatt, a Representative and a Senator from Georgia; born in Amelia County, Va., October 2, 1781; pursued an academic course; attended William and Mary College, Williamsburg, Va., and graduated from the medical department of the University of Pennsylvania at Philadelphia in 1801; moved to Petersburg, Elbert County, Ga., and began the practice of medicine; member, State house of representatives 1803-1805; resumed the practice of medicine; elected as a Democratic Republican to the Ninth Congress to fill the vacancy caused by the resignation of Thomas Spalding; reelected to the Tenth and to the three succeeding Congresses and served from January 26, 1807, until his resignation November 6, 1813, having been elected Senator; elected as a Democratic Republican to the United States Senate to fill the vacancy caused by the resignation of William H. Crawford and served from November 6, 1813, to November 9, 1816, when he resigned; moved to Alabama Territory and was appointed the first Territorial Governor; elected as the first Governor under the State Constitution and served from March 1817 until his death near Coosada Station, Elmore County, Ala., July 9, 1820; interment in the family cemetery, Coosada Station, Ala.
American National Biography; Dictionary of American Biography; Mellichamp, Josephine. William Bibb. In Senators From GeorgiaHuntsville, Ala.: Strode Publishers, 1976, . pp. 72-74; Bibb, William Wyatt. In Inquiry into the Modus Operandi of Medicines Upon the Human Body. Philadelphia: Carr Smith, 1801.